Silver Z-Caps are non-polarized capacitors. Most amplifiers are delivered with either standard type MKP (PP foil) capacitors or electrolytic capacitors. For upgrading the coupling capacitors in amplifiers, we highly recommend choosing our Superior, Silver, SilverGold or Alumen Z-Caps. Our Silver Z-Cap Capacitors is a super smooth capacitor without any harsh additions to the sound, bringing forth an absolutely neutral tonal balance. Highly recommended for use as a high-end tweeter capacitor or as a coupling cap in an amplifier. 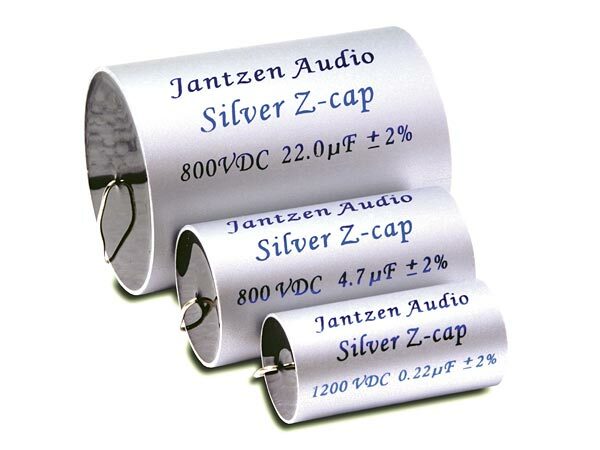 All Jantzen Audio Z-Caps are nitrogen filled, which means that you get more foil per capacitor and no risk of the evaporation that can occur in oil/dielectric fluid filled capacitors.